New Years Eve for me has always been about celebrating with friends, setting off fireworks, and enjoying bringing in the new year. 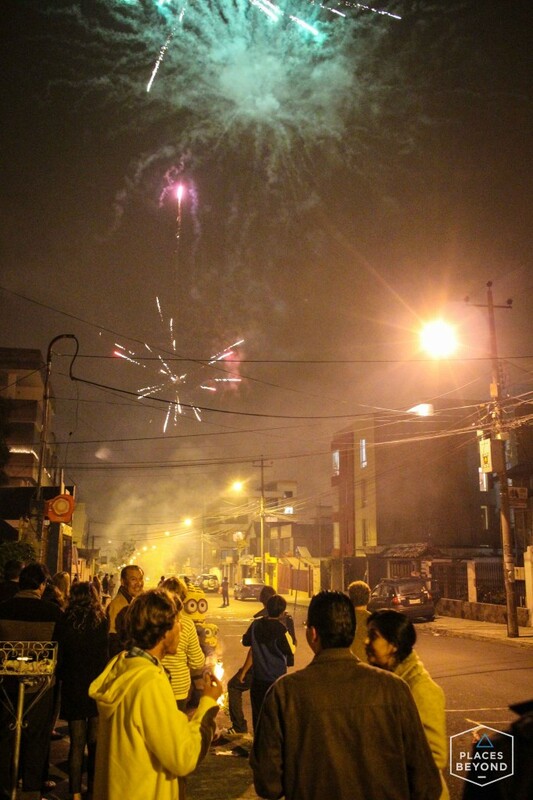 Turns out even though I’m in South America, this New Years would be no different. 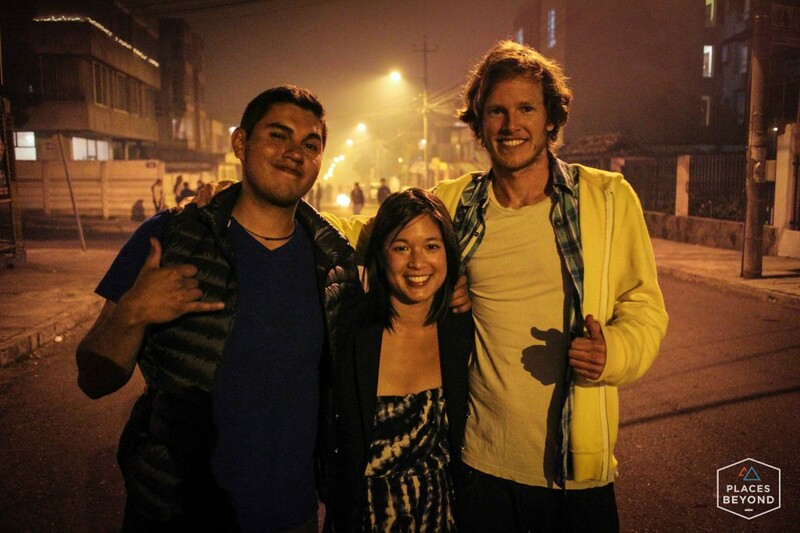 My friend Su-Yin and her boyfriend Simon have been living and working in Quito for a year so I rode from Colombia to get there in time to celebrate with them. Upon my arrival into the sprawl of the capital city I realized this would be a new years unlike any other. As I came around a corner on the highway the car in the lane to my right was stopped and there was a group of 5 or 6 women with bright colored hair and flashy outfits surrounding the car. I hit the throttle and sped by looking back wondering what was going on. So far Quito is an interesting place. I definitely won’t be bored. 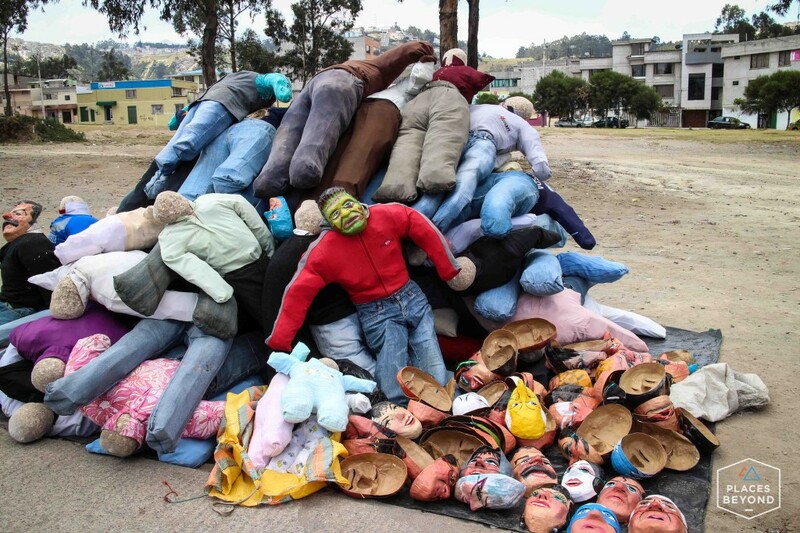 When I came to a traffic light I stopped and saw there was a makeshift market on the side of the road selling effigies. 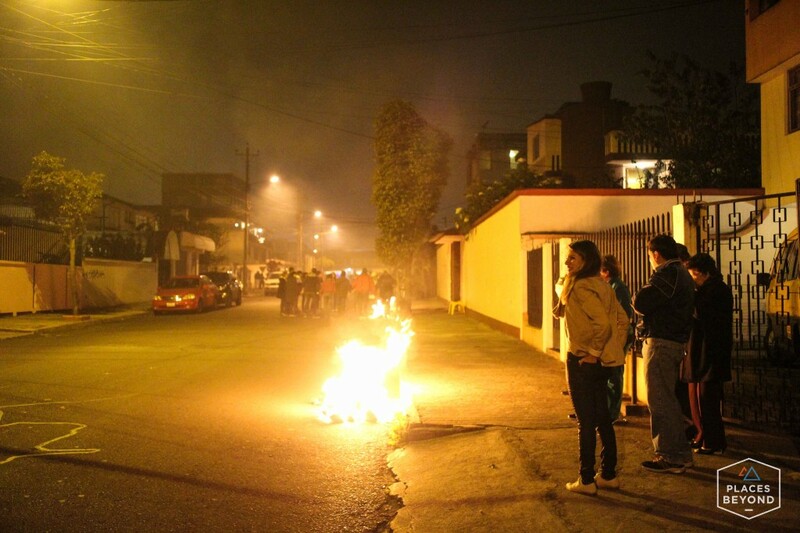 I had heard about this tradition they have here where at midnight people burn effigies called “Año Viejos” (Old Year). 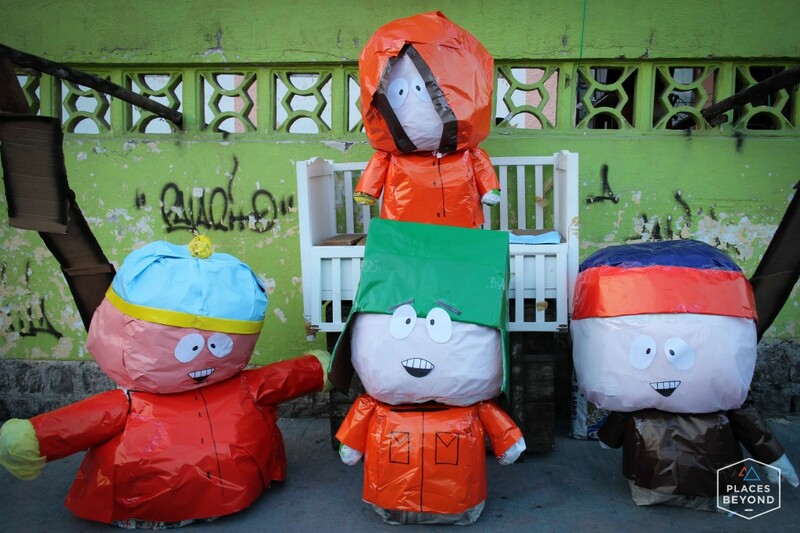 The effigies represent the old year and they burn it away to start the new year fresh. 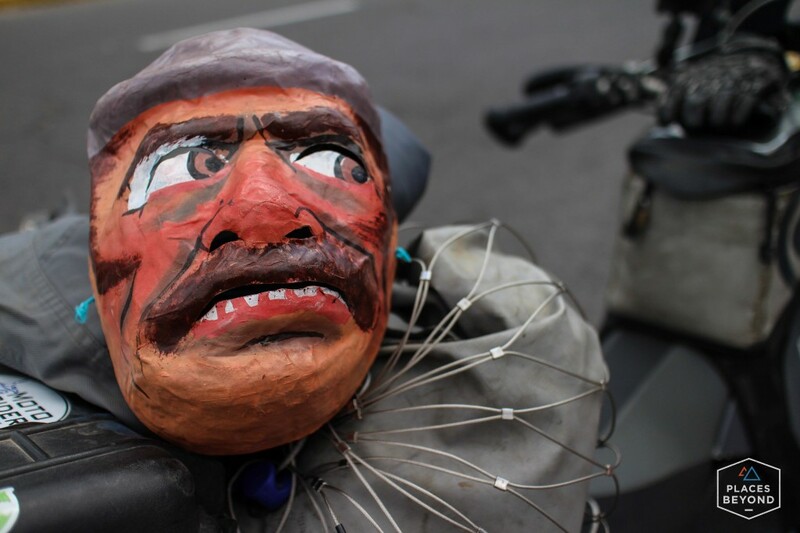 The effigies are made of straw or sawdust and dressed in clothes and they put masks on them. The effigies were selling for $60US (probably a gringo price) but the mask was only a $1 so I bought a mask. I met up with Su-Yin, Simon, his brother Dave and we took the bus to the northern part of the city where their friend Cheo’s family was having a New Years party. 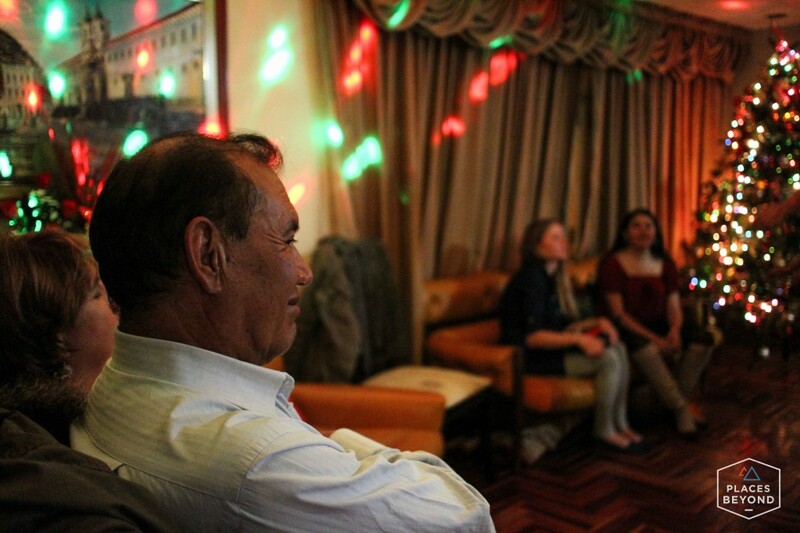 When we got to to Cheo’s house I learned about another NYE tradition they have in Ecuador. The mob of women I saw surrounding the car earlier in the day was actually a group of men dressed in drag. The tradition is that men dress up as the widows of the Año Viejos and they go into the streets to collect money for the funeral (the funeral being the new years party). So on every street we went down in Quito men dressed in short skirts and pink wigs were pulling hoses and ropes across the road to stop cars. They’d have stereos playing music while they danced and collected a nickel or more from passing cars. What a tradition. This went on all night. As we walked around the neighborhood people had their Año Viejos on display. Many cars driving by had them tied to the hoods. Tonight would surely be a wild night. 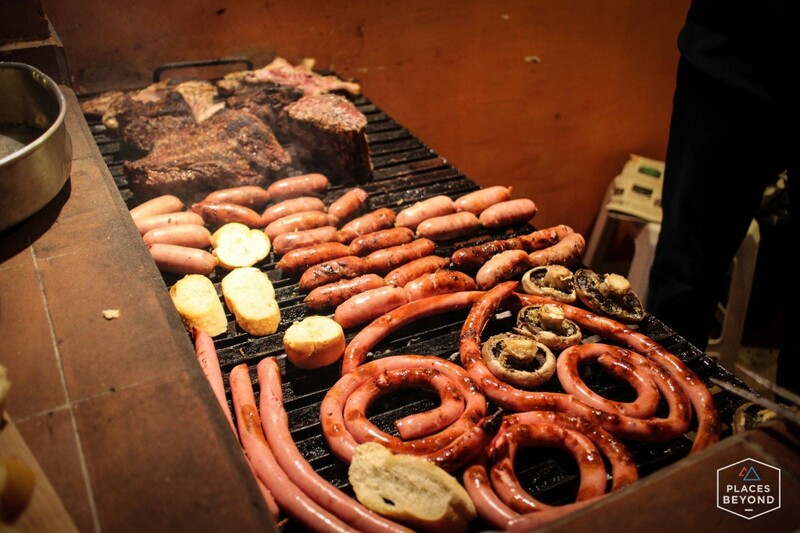 Cheo’s family cooked up the biggest BBQ ever. Plates of sausage, meat, cheese, garlic bread, and more kept being served to us. Even before midnight fireworks were going off throughout the city. From the rooftop deck we had a great view of the city. When midnight struck we all went outside to the street and counted down the final seconds of 2013. 3,2,1. Feliz Año! With that Cheo and every house on his street set the effigies on fire. Simultaneously fireworks were going off from every direction. Before I could take in the sights I was handed 12 grapes. It’s tradition they said. You have to eat 12 grapes at midnight. Then I was handed a glass of champagne. “Drink, it’s tradition”. Everyone hugged and greeted each other shouting “Feliz Año!” to passersby. 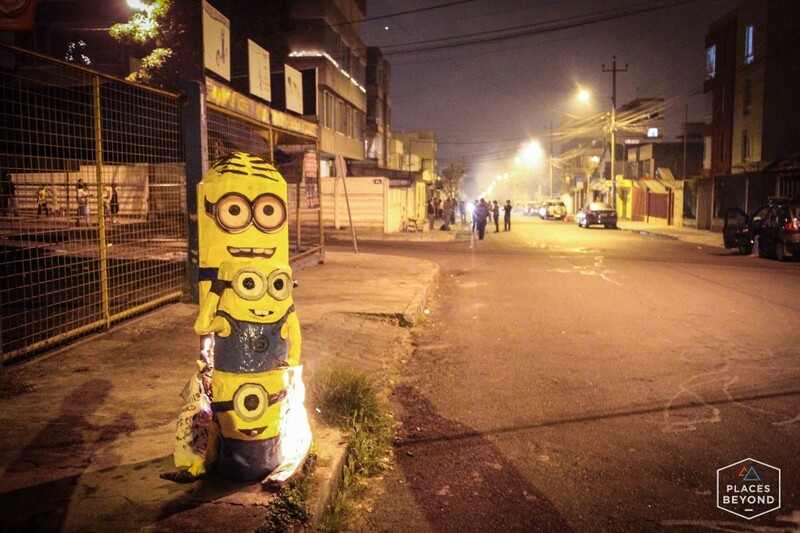 Cheo handmade these Despicable Me effigies. As the street filled with smoke, flames, and fireworks, Cheo said there was another tradition. 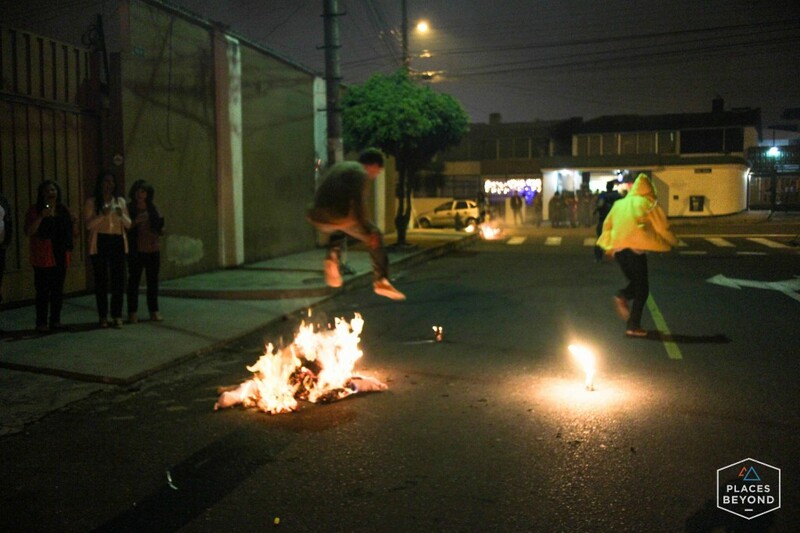 It’s good luck to run around the neighborhood and jump over 12 burning effigies. One for each month. So off we ran. Huffing and puffing as the streets were filled with so much smoke. As we were running down the streets others were walking down the streets with suitcases in tow. I wondered where these people were going. Then I learned that it was yet again another tradition. If you want to travel in the new year, you walk around the neighborhood with your suitcase for good luck. People would cheer and clap. It was the funniest thing. 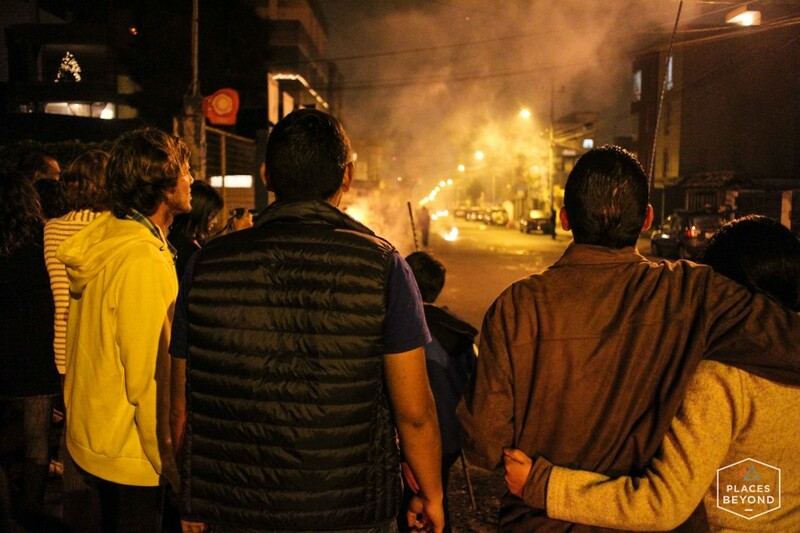 They walked proudly down the burning streets with a look of determination on their faces. Yep, we’re going traveling this year. I should have brought my bag! Hope the jumping over burning effigies gives me enough good luck for the rest of my travels. Cheo’s dad hanging out enjoying the party. In typical latin tradition the stereo was maxed out, the speakers crackling. But the dancing went on. Thank you for the best New Years Eve ever, Ecuador. 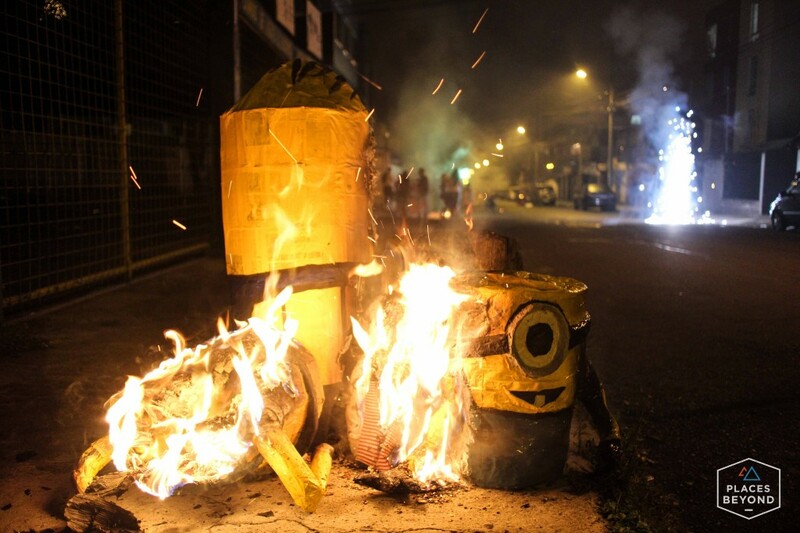 I don’t know if there’s a place that can top the over the top traditions and celebrations that go on in Ecuador. Feliz Año Nuevo! Yea the definitely know how to celebrate. 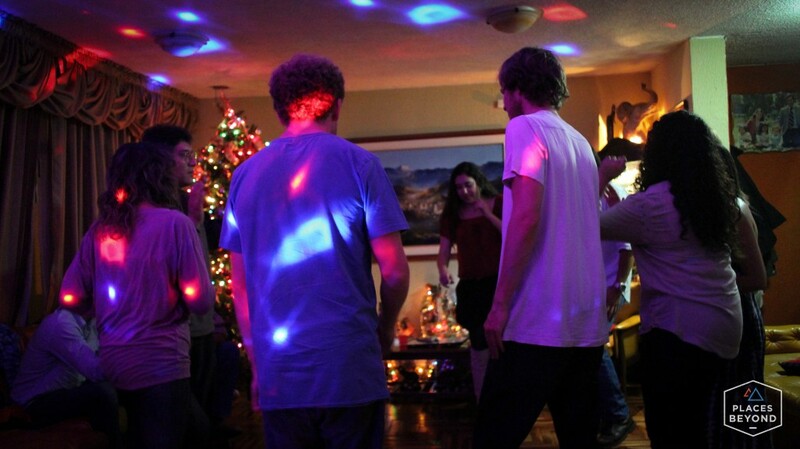 What neighborhood of Quito would you recommend for New Year’s eve. We are just arriving the day before and want to catch as much culture as possible (and be safe). Any suggestions. sounds like you had a wonderful time.